Omar thinks cold cash, or hypnosis, keeps Congress toeing the Zionist line. Does she lack the political imagination, the information, or a filter on conspiratorial thinking, to see the real reasons for U.S. support for Israel? At the start of the week, Democratic Congresswoman Ilhan Omar from Minnesota was back in hot water over tweets on Israeli influence in American politics. This time, according to Omar, “It’s all about the Benjamins,” the cash keeping U.S. civil servants towing the Zionist line. It’s telling that Ilhan Omar fell so quickly back into an anti-Semitic trope after a protracted public controversy over earlier tweets on Israel hypnotizing the world. It is also grating to see Republicans like House Minority Leader Kevin McCarthy, who once suggested wealthy Jews were trying to “buy” the midterm elections , pounce at the opportunity to score partisan points. Congresswoman Omar did ultimately apologize , albeit only after censure by the House Democratic leadership. 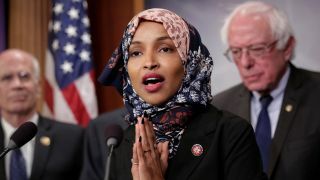 Beyond the offensive nature of the whole ordeal, Omar’s comments betray a serious misunderstanding about what makes support for Israel such a potent political current in the United States. Conspiracy theories often tell us what we want to hear, and it’s convenient to view one’s ideological rivals as mindless drones who can be activated on command or with payment. If only the puppet masters could be overthrown, the whole system would come crashing down. But the reality is more complicated, and it does the Palestinians no favors to embrace an overly simplistic outlook that sees American Israel lobby money as the lynchpin holding the occupation in place. Much of Israel’s political cachet in American domestic politics comes from the Christian evangelical community. Their ideological conviction is real and requires no buyout. Evangelical support is far more uncritical than that of other demographics. Indeed, a far greater portion of Christian evangelicals than American Jews believe God gave Israel to the Jewish people. Christians United for Israel boasts the largest membership of any pro-Israel institution in the United States. Many U.S. politicians are themselves evangelicals. Those who aren’t still recognize evangelicals as a significant constituency — a full 25 percent of the American population and the largest single faith group in the country. But Israel’s religious appeal is not exclusive to one confession. After all, much of American Jewry, a small but politically engaged minority, feels a genuine (if more philosophically fraught) bond with Israel, independent of any lobby. Then there are the nonreligious aspects of the relationship with Israel that are more broadly appealing to Americans, especially but not exclusively on the right. There is the clash of civilizations element: the idea that Israel is a democratic outpost of Western civilization on the edge of an untamed wilderness, a tale evocative of the United States’ own expansionist parable of manifest destiny. This was convenient during the Cold War, when noncommunist Israel beat back an alliance of Soviet client regimes in the Arab world, and it has taken on new life in the aftermath of the September 11 attacks, with Israel’s enemies recast in the same mold as the Islamic fundamentalist hijackers who brought down the Twin Towers. Some of these intangible conceptions have translated into real policy: for instance, George W. Bush’s administration imposed an embargo on helicopter spare parts to Israel as a protest over targeted killings in the second intifada. After 9/11 and the commencement of the “global war on terror,” Bush lifted the ban. Of course, many of Israel’s foes are religious fanatic terrorists and, in widely televised incidents, some Palestinians in the occupied territories did celebrate on 9/11. And Israel is a key American strategic and intelligence partner in the Middle East. Not everything about popular American notions of Israel are untrue so much as they have become a distorted civic mythology in which Israeli actions are viewed with a less critical eye and the Israelis and Palestinians are treated in zero sum terms. Pro-Israel organizations like AIPAC certainly capitalize on these themes, but they are not solely responsible for creating them. U.S. politicians enthusiastically play up support for Israel to their constituents in a way that they do not with other American allies, even other liberal democracies. When was the last time a congressperson led a rally in support of the U.S.-Germany relationship? The truth is that elected leaders don’t simply boost Israel to cash in. They do so because it is appealing to constituents of many political stripes. Republican support is louder and emboldened by more religious fervor, but Democratic backing for Israel is fairly steady too, according to a 2018 Gallup poll. There is a pro-Gulf state lobby in Washington (equal, if not exceeding the pro-Israel lobby’s influence). Spending on lobbying and PR efforts on behalf of several Arab governments well outpaced similar pro-Israel expenses last year. Yet you don’t see American officials parading their support for Saudi Arabia or the United Arab Emirates in front of voters. The pretext for Congresswoman Omar’s latest contentious tweet was Kevin McCarthy’s threat of punitive action against her and Rashida Tlaib over their Israel criticism. McCarthy admonished the two Democratic representatives in a public way because it mobilizes the Republican base and inflames a wedge issue among Democrats. Contra Omar, no “Benjamins” were required to make such a move politically expedient for the GOP, even as it helps turns Israel into a partisan football. When and if the historical trends buoying the U.S.-Israel relationship are overturned, it will be in part because of this politicking (in which Prime Minister Benjamin Netanyahu has participated), combined with a growing impatience with Israeli leaders who make no scruples over their intention to annex the West Bank and definitively close the door on a two-state solution. The Palestinians’ ability to insert themselves into the American consciousness with appeals to historical moments like the civil rights and anti-apartheid movements will also be critical in a country where it is very easy to identify with Israel. Pro-Israel organizations like AIPAC do wield real influence, but they are only one part of the story. In the meantime, Ilhan Omar’s political imagination seems not to account for the idea that Israel could carry genuine allure for Americans without relying on artificial interference, whether cash or hypnosis. Omar ignores how uncritical elements of U.S. support for Israel evolve from very American cultural motifs. Ironically, building support for a just and sustainable Israeli-Palestinian peace will require overcoming these preconceptions. Initially, Ilhan Omar, like U.K. Labour Party leader Jeremy Corbyn , seemed content to fall back on tokens and reflexive defensiveness when she was called out for anti-Semitism. Her apology is a welcome development, but this is the second such incident in two months. That’s why it is even more imperative that she also correct the record with real actions, and by substituting conspiratorial thinking with a solid grasp of the real triggers underlying American ties with Israel.